So your designer just came up with an amazing new animation on Adobe After Effects for your web application, fantastic! Just one problem, how do you convert this to a format usable within your web app? No worries, the awesome folks at Airbnb Design have your back. Introducing, Lottie , a fantastic new technology that allows you to use these animations in real time in a lightweight and flexible format just as easily as static images. In this article, we&apos;ll be looking at how we can leverage the power of Lottie to add more life to our React Applications. To do this, we&apos;ll be using an npm package called react-lottie to generate viewable animations from JSON files exported by Bodymovin. Since we&apos;ll be focusing on the app side of things, we won&apos;t look into how these animations are created in After Effects but rather use animations created and open sourced by designers on Lottiefiles. If you have animations on After effects that you would like to use, you can export them to JSON using the Bodymovin plugin for After Effects. For this tutorial, we&apos;ll build this application which consists of two types of Lotties, one regular one and another with controlled animations depending on certain values in state. This will create some boilerplate code for our app and configure our react development environment. Open up the lottie-demo directory and let&apos;s get coding. Yarn is create-react-app&apos;s default package manager and it&apos;s what we&apos;ll use to handle our dependencies(or rather dependency since there&apos;s only one for this project) so it&apos;s worth looking into as well. Great, we are all set to go, now let&apos;s add our animations. We&apos;ll bve getting our sample animations from LottieFiles, so head over there and create a free account. LottieFiles gives you access to a curated library of awesome animations from designers all over the globe, it also provides a platform to test, upload and share your own animations and is a great resource in general. Simply browse through the animations, tweak the settings if necessary and when you are happy with what you have click Download JSON to get the animation. Now inside the src directory of our application create two more directories, components and lotties . These will hold or React components and Lottie animation data respectively. Place the downloaded JSON files inside the lotties directory. Awesome, now we are ready to create components that display these animations. Animations can be allowed to run freely or be manipulated by data in state. First, let&apos;s look at the first case and create an animation that simply imports and renders a lottie. Create a file called UncontrolledLottie.jsx inside the components directory and place the following code inside it. These are just some of the options you can provide. We also provide the dimensions(length and width) of out animation as props to Lottie. Great, this animation is now ready for use by importing it into our App.js and will look like this: But first let&apos;s add our controlled Lottie. 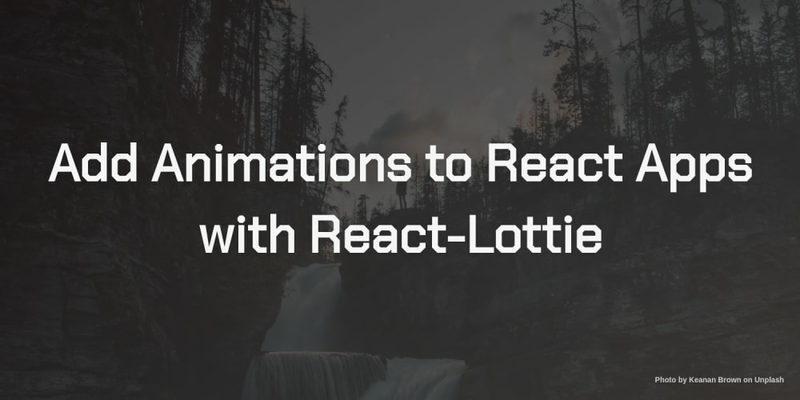 Lotties can be manipulated in React to change some of their properties using data in state. In our case, we&apos;ll look at how we can play, stop and pause the animations in our lottie. Let&apos;s analyse this code. At first glance it is pretty much identical to the code in ControlledLottie.jsx but there&apos;s a few key differences. We&apos;ve added 3 buttons at the bottom along with their styling. These buttons are used to toggle the values of the data in state. Both our animations are ready to use now so let&apos;s import them into App.js and display them in our app. Edit the code in App.js , importing our components and adding them inside the render function. Let&apos;s style the our app to make it mobile responsive, we can do this using css grid. Add the following code to your App.css file. This places our lotties in two columns that will be reduced to a single column on devices with a smaller width. Now fire up the application and watch the magic happen. Your browser will open up and you should be able to see the two animations active. Clicking Pause will have the controlled animation freeze in it&apos;s current frame, clicking it again should resume it as well as clicking Play . Clicking Stop returns the animation to it&apos;s default position and holds it there. Pretty nice, right? Lottie can be used to really add life to an application, be it on web or mobile. They can be used to make applications more interactive and provide visually appealing feedback, for example animations indicating the state of certain processes. Lotties are also amazingly easy to use and extremely lightweight so they shouldn&apos;t have a massive impact on the perfomance of your application. Always looking to learn new stuff. A lover of gaming and fancy gadgets who enjoys the company of other humans.